Excel has some powerful functions to calculate the number of days between two dates in Excel. These are especially useful when you’re creating Gantt charts or timelines for a proposal/project. Excel Days function can be used to calculate the total number of days between two dates in Excel. 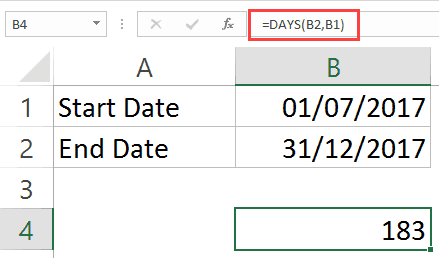 You need to specify the ‘Start Date’ and the ‘End Date’ in the Days function, and it will give you the total number of days between the two specified dates. Note that you can also manually specify the dates in the Days function by putting it in double quotes. Just make sure these dates in double quotes is in an accepted date format in Excel. 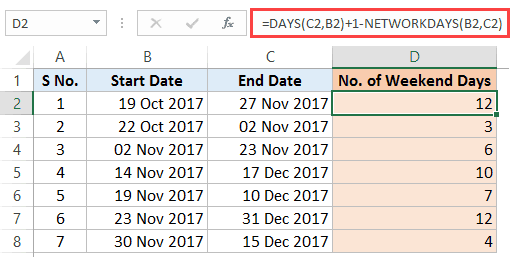 Days function gives you the number of days between two dates. This means that if the dates are 1 Dec 2017 and 2 Dec 2017, it will return 1. If you want both the days to be counted, you need to add 1 to the result of Days function. You can read more about the Days function here. Excel has two functions that will give you the total number of working days between two dates and will automatically account for weekends and specified holidays. 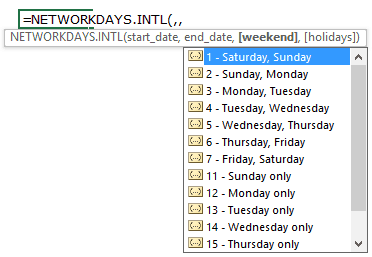 Excel NETWORKDAYS function – you should use this when the weekend days are Saturday and Sunday. 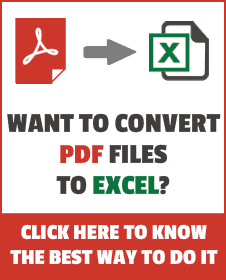 Excel NETWORKDAYS INTERNATIONAL function – use this when the weekend days are not Saturday and Sunday. Let’s first quickly have a look at NETWORKDAYS Function syntax and arguments. end_date – a date value that represents the end date. [holidays] – (Optional) It is a range of dates that are excluded from the calculation. For example, these could be national/public holidays. This could be entered as a reference to a range of cells that contains the dates, an array of serial numbers that represent the dates, or a named range. Let’s first look at an example where you want to calculate the number of working days (business days) between two dates with Saturday and Sunday as weekends. This function works great in most cases, except the ones where the weekends are days other than Saturday and Sunday. For example, in middle-eastern countries, the weekend is Friday and Saturday, or in some jobs, people may have a six-day workweek. To tackle such cases, Excel has another function – NETWORKDAYS.INTL (introduced in Excel 2010). [weekend] – (Optional) Here, you can specify the weekend, which could be any two days or any single day. If this is omitted, Saturday and Sunday are taken as the weekend. [holidays] – (Optional) It is a range of dates that are excluded from the calculations. For example, these could be national/public holidays. This could be entered as a reference to a range of cells that contains the dates, or could be an array of serial numbers that represent the dates. Now let’s see an example of calculating the number of working days between two dates where the weekend days are Friday and Saturday. The third argument in this formula (the number 7) tells the formula to consider Friday and Saturday as the weekend. We can use the NETWORKDAYS function to calculate the number of weekends between two dates. 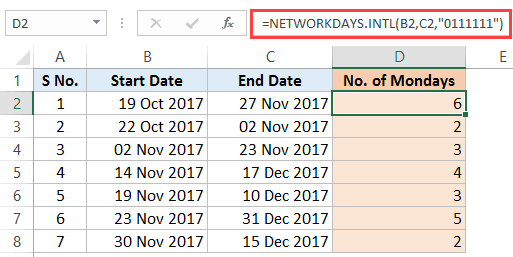 While the Networkdays function calculates the number of working days, we can also use to get the number of weekend days between two dates. You can use the Excel NETWORKDAYS.INTL function to calculate the number of work days in a part-time job as well. Let’s take an example where you are involved in a project where you have to work part-time (Tuesday and Thursday only). Note that instead of choosing the weekend from the drop down that’s inbuilt in the function, we have used “1010111” (in double quotes). The first number of this series represents Monday and the last number represents Sunday. So “0000011“ would mean that Monday to Friday are working days and Saturday and Sunday are non-working (weekend). In case you have holidays (which you don’t want to get counted in the result), you can specify these holidays as the fourth argument. To find the number of Mondays between two dates (or any other day), we can use the same logic as used above in calculating part-time jobs. In this formula, ‘0’ means a working day and ‘1’ means a non-working day. This formula gives us the total number of working days considering that Monday is the only working day of the week. Similarly, you can also calculate the number of any day between two given dates. Convert Date to Text in Excel. Using DATEDIF Function in Excel. Guys!!! Please tell me some one days calculator for android mobiles and iphone mobiles. Please tell me some android application names for days calculator. I would like to calculate the number of months in the attached table. Can anyone help me? Hi Sumit, Very informative. Thank you. Especially the use of the binary day-of-week parameter. That could be handy. I have a excel sheet and i want to send alert mail as a list of customers whose Software LIC are going to expire on so and so date. Thanks for sharing the informative post. Keep it up. Hi Sumit, thanks for the tutorial, very informative. How do I calculate time in hours between dates. If you want to calculate the working hours from 15.00 in afternoon until 09’00 the next morning? If your working hours is 08h00 to 17h00, the working hours would be 3 hours in total ( 2 from previous day nd 1h for present day). Any formula to calculate the total working time between dates? Hey.. when you have days changing, you need to use the date as well as time to make the entry. Once you have two dates with time, just subtract first from the later. I need to calculate the # of days between 2 dates, but excluding Sundays, so only 7 days in a week, Including Holidays. you can use the NETWORKDAYS.INTL funtion and select Sunday as weekend. I need to calculate the # of days between 2 dates, but excluding Sundays, so only 6 days in a week. Anyone know a function/formula that can accomplish this?